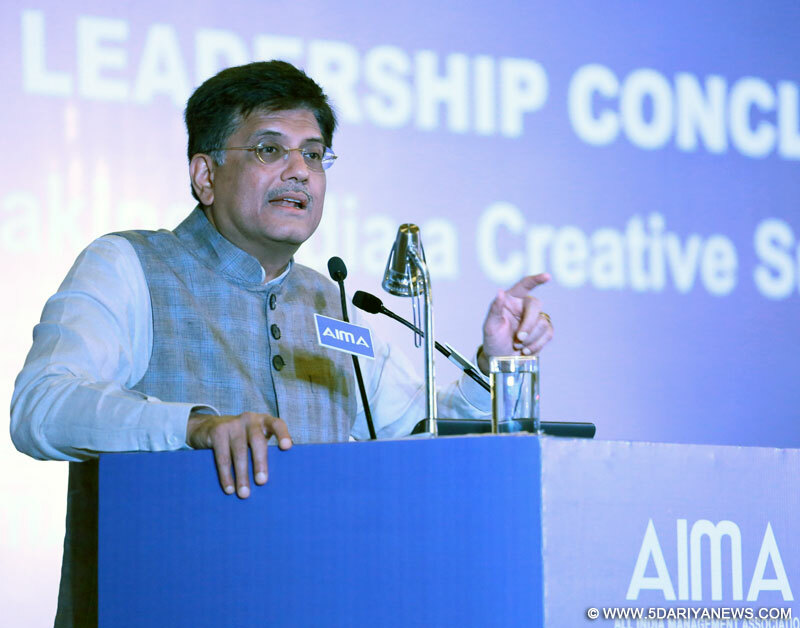 The Minister of State (Independent Charge) for Power, Coal and New and Renewable Energy, Shri Piyush Goyal addressing at the AIMA's 2nd National Leadership Conclave on “Breaking Through: Making India a Creative Superpower”, in New Delhi on March 03, 2016. The minister criticised the target set by the UN in its sustainable development goals (SDGs) which has fixed 2030 as the target year for providing electricity to all the people in the world.“It should be done much faster than that (2030). Why should the people wait for 15 years for electricity?” Goyal asked, remarking that it was very sad and unfortunate that such a long target has been fixed for this basic facility for the common man.He urged all countries in the world to work together to achieve the UN SDG target much ahead of schedule.Pointing out that in India, there were more than 18,000 villages still without electricity, the minister said Prime Minister Modi has set a target to provide access to affordable housing, toilet, electricity, digital world (mobile plus internet), healthcare and education to all the people in the country. The minister said the government has been able to produce electricity at a much lower cost, helping save Rs.180,000 crore annually. It has also worked out a plan to increase power from renewable sources. “We are increasing our renewable energy sources five-fold from about 34 GW last year to by about 175 GW by 2022. And to reach this goal, every part of the action and plan has been worked upon,” he said. The minister said for the government, both energy efficiency and energy security are important, but priority wise, security came first and efficiency later. With the theme of “Connecting Asia” this year, the flagship conference called Raisina Dialogue 2016 is designed to explore and examine the prospects and opportunities for Asian integration as well as Asia’s integration with the larger world. More than 100 experts from 35 countries, including from the US, Germany, Britain, China and Japan, participated in the three-day event that concluded on Thursday.